Where do you stand? Arbitration by the deposit service is not contractual according to my AST, I was quite happy with this as I imagine a small claims court would take a dim view of someone who avoided an alternative to the courts. But where do you stand if your landlord is not UK resident? Is there any point in issuing small claims summons against them if the judgment cannot be enforced because they are outside the UK? Does the LL have a UK bank ac to receive the rent? I believe the courts can put a charge on a UK bank ac, but check with the CAB or even the small claims court as they should know. I don't know, it's all handled by an agent. I think I might give shelter a call. Your landlord is required by law to supply you with a UK address you can use for all legal purposes - either himself or an agent authorised to act on his behalf. I can't quote chapter and verse, but a legal advisor - including presumably free ones like the CAB or shelter - should be able to look it up. AIUI you can pursue the agent if necessary, and if they say "not me guv" then neither is the rent any of their business. IANAL. Don't act on the above without checking it. DYOR. 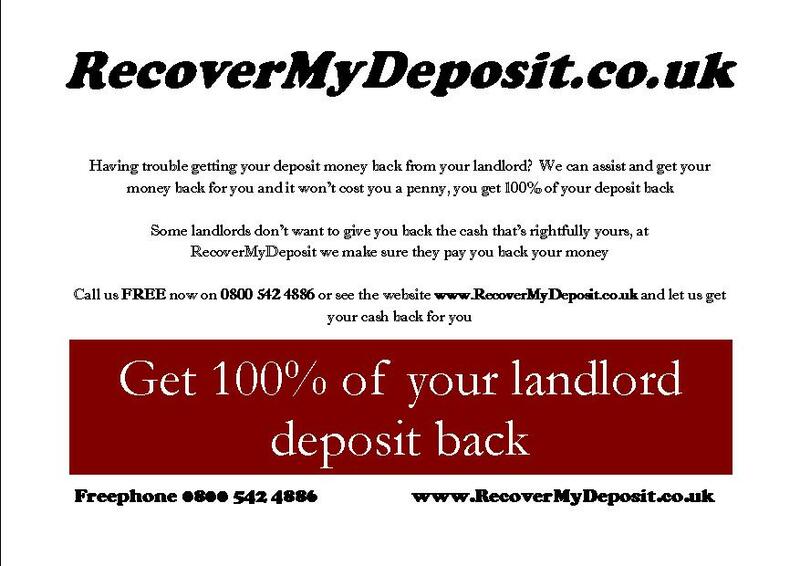 UK laws on protecting a tenant deposit changed for the good of the tenant in April 2007, when the Tenancy Deposit Protection regulations came into force. People taking an Assured Shorthold Tenancy (AST) who 1) Pay a Deposit; and 2) whose Deposit can be used if the tenant falls into arrears or messes up the property are owed duties by the landlord (*provided that the annual rental is no more than £25,000 PA, though as of October 1st 2010, that amount will rise to £100,000 PA). They are that the Landlord must pay the deposit into one of the approved schemes and that the Landlord must also give the tenant specific information to his/ her deposit and the scheme into which it is placed. If this is not carried out within a given timeframe, then the tenant can take the Landlord to Court and the Landlord will be forced to pay a set amount of money under a Strict Liability court ruling. The Landlord may make defend the claim or even make a counter-claim if they believe that you have breached the terms of the AST, but this cannot be used as mitigation and has nothing to do with the tenant claim. Courts have usually ordered that the Landlord make a separate claim. The property that you rented must have been one that you occupied as you main home and one where the Landlord did not live at the property but lived elsewhere. If the Landlord lived at the property, they will not usually have to protect the deposit, although the rules are quite complicated (Paragraph 10 of Schedule 1 of the Housing Act 1988). The claim is always against the person who received the deposit, if it was the Landlord, then the claim is against them, if it was an Agent, then they are directly responsible for the deposit. The law says that the ‘Landlord’ includes anybody that is acting on their behalf and if in doubt, sue the Landlord. If there is more than one of them, make a claim against them all. Note that the address has to be in England or Wales. If you are unsure of who the responsible person is, make the claim against the Landlord. You can find out who the Landlord (registered proprietor) is by asking the person to whom you pay the rent. They have a duty to provide the information to you within 21 days, failure to do so is a Criminal Offence under UK law. Many Landlords try to hide their details through their Agent but the Agent cannot refuse to provide the information that you request. The legislation is to protect tenants in the UK and not provide them with a windfall payment. However it has been shown that the Courts do not take kindly to Landlords that wilfully ignore, or seem to wilfully ignore the basic and simple regulations. The most important question is does your tenancy predate the TDS or not. Its a legal requirement if your AST was signed after the TDS came into force.